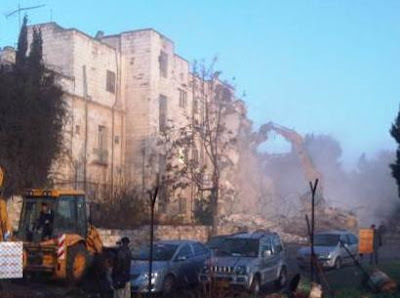 A private Israeli company is razing the historic Shepherd Hotel in East Jerusalem and will construct a housing area in its place. The move has angered Palestinians, who hope that East Jerusalem, where the hotel was located, will be the capital of the future state of Palestine. Of course, the mayor of Jerusalem, an influential voice in Israeli politics, just stated that the city will never be divided, that the entire city of Jerusalem, including the eastern section, was, is and will always be the capital of the state of Israel. Many Israelis were pleased to see the destruction of the Shepherd Hotel. The building was built in the 1930's and was the home of Haj Muhammad Amin al-Husayni, at that time the Grand Mufti of Jerusalem, and later an avowed supporter and ally of Adolf Hitler during World War II. After the British exiled al-Husayni from the Palestinian Mandate in 1937, they used it as a military office building. When the Jordanians occupied and administered the area from 1948 to 1967, control reverted to the Mufti's estate, which rented it to the hotel operators. In 1967, the Israelis seized the area of East Jerusalem in the Six Day War and have occupied it ever since. The Israelis condemned the Shepherd Hotel building and passed control of it to the government Custodian of Absentee Property. It was later sold to a Jewish American developer. It was the condemnation and later sale of the building that the Palestinians cite as an illegal seizure of Palestinian property. The Palestinian position is quite clear, although ignored. According to the spokesman for Palestinian President Mahmoud Abbas, "Israel has no right to build in any part of East Jerusalem, or any part of the Palestinian land occupied in 1967." The destruction of the hotel is not in and of itself that problematic. Although the building is described as historic and does make for an interesting story, it pales in comparison to other buildings in the area. It is Jerusalem, after all, holy to three of the world's major religions. The destruction is, however, symptomatic of continued Israeli consolidation of its claim to, and hold over, the entire city of Jerusalem. Since taking the entire city in 1967, the Israelis have consistently expanded their presence into traditional Arab areas. Minister of the Knesset (and later prime minister) Ariel Sharon developed a unique tactic called "block busting" for Israeli expansion. Sharon would buy an apartment in an Arab neighborhood and move in. The government would then condemn and confiscate the surrounding apartments "for security reasons," thus changing the Arab character of the building and area. Once that happened, the Arab landowners sold their property in droves to get away from the Jewish expansion. 'Adnan al-Husayni (yes, related to the late Grand Mufti), Palestinian "governor" of the Palestinian Authority's governorate of Jerusalem, said the demolition was the latest in a line of demolitions of historic buildings and accused Israel of "trying to erase any Palestinian identity" from the city. I can see his point. The Israeli government counters that its Arab citizens are allowed to buy or rent property in Jerusalem's neighborhoods that have a Jewish majority. The claim is a bit disingenuous. Many of the areas are reserved for veterans, and since virtually all Israelis serve in the military, theoretically it is open to all. Not quite, since Israel's Arabs are exempt from mandatory military service. To her credit, U.S. Secretary of State Hillary Clinton said the razing of the hotel "undermines peace efforts to achieve the two state-solution," and "contradicts the logic of a reasonable and necessary agreement...on the status of Jerusalem." The status of Jerusalem is the key issue to a lasting agreement between the Palestinians and Israelis. Statements by either side have not been helpful toward that goal.